This wonderfully low budget film opens up with a Theremin sounding organ and horn section indicative of 50s travalogue adventurous jaunty shorts.The story concerns the Drake family curse that has reigned over 180 years. Wilfred Drake the great ancestor who massacred a tribe of head hunters in Ecuador, has damned each generation of his family to a horrible death once they reach the age of 60. “Could one man have lived long enough to put all 3 skulls in there?” asks Lt Rowan to Dr Bradford who says “I know of no such case in medical history”Alison Drake finds a passage in one of the text books. “That’s it, that’s the way it appeared, the impression on the skulls.” We see 5 skull icons printed on the finger tips of a hand. There are 2 surviving brothers. Jonathan played by Eduard Franz is coming upon the age where he is destined to be found decapitated.Kenneth Drake played by Paul Cavanagh has already died without his head. His skull has wound up in the family vault amongst their predecessors as expected. The remaining Jonathan Drake, while attending his brother Kenneth’s funeral, is disturbed when they find that his head is missing. When Kenneth’s skull winds up in the locked cabinet in the family vault, Jonathan Drake fears that the ancient curse placed upon his grandfather by a tribe of South American Indians is very real,and frighteningly he is the next victim. That night Zutai ,the very imposing Zombie is sent to behead Kenneth. He climbs stealthily up the rose trellis.The creepy appearance of his lips sewed together with string, and wielding a poisonous curare-tipped bamboo knife gives the film it’s campy allure. Zutai doesn’t succeed in taking Kenneth’s head that night as he is interrupted by the butler and so he escapes into the garden, and comes back for the head at the funeral parlor cutting Kenneth’s head off while in the coffin. We know that this hulking evil fiend is lifeless, because the skin sample he leaves behind is that of a corpse. and the sandals they find are also made of human skin. This brings in to investige the skeptical policeman Grant Richards who plays Lt. Jeff Rowan, who follows the leads that eventually bring him to Dr Emil Zurich played by the inimitable Henry Daniell, a Swiss anthropologist whose hobby it is to shrink heads! In the climax of the film, it is discovered that Dr Zurich actually died 180 years ago, and that’s he’s really the witch doctor from Ecuador using Dr Zurich’s head as a disguise. The white man’s head has been mystically sewn atop the witch doctor’s brown Indian body, as we see the severed stitch work on the neck between the white man’s head and the dark “savage” skin of the South American Jivaro witch doctor once his shirt is ripped open to expose the brown skin. Again, we have a theme where it’s us again them, the strange cultures that invade, beware of the savages, they’ll take your head! and even shrink it too! Dr Zurich has kidnapped Jonathan’s daughter Alison as leverage to get her father, but by summoning voodoo powers to help him, Jonathan having learned the secret, that if Zurich is unsuccessful in taking the last Drake’s head, he will be doomed forever in his state never to rest. Jonathan in order to make Zurich’s death final decapitates him, severing the white head from the brown body,which then crumbles into dust. I wonder if this was a not so subtle cautionary tale about keeping race and religion separate and as far away from”us”. To severe the connection, thus no danger. After all it was the white anthropologists studying “the Other” tribe that brought about the massacre and inescapable curse. The rituals and magic of the tribe are evil and not to be tampered with. But again, it’s also just creepy fun to look at large cretins with their lips stitched together, in human skin sandals that make silly whinnying noises when they burst into flames. The film really has a nostalgic eeriness to it. It’s not one of the more significant vintage horror films of the 50s, but the appurtenances of voodoo shrunken heads, the skulls and poison darts, lips sewn together and the looming giant of a Zutai who’s own lips have been stitched shut, looking for fresh heads to decapitate, and of course the sinister presence of Henry Daniell who is always fabulously droll, makes it one of my favorite Saturday afternoon or late Friday night treats. MG. This is one of those great old films that I’d deliriously wait up for late at night as a child. On CHILLER THEATRE on WPIX, ch.11 or FRIGHT NIGHT on WOR ch.9 out of NYC where I proudly grew up. remember the claymation 6 fingered hand that would come up out of the swampy graveyardesque ground, and the eerie voice would croak CHILLER, slowly in a ghoulish growl. 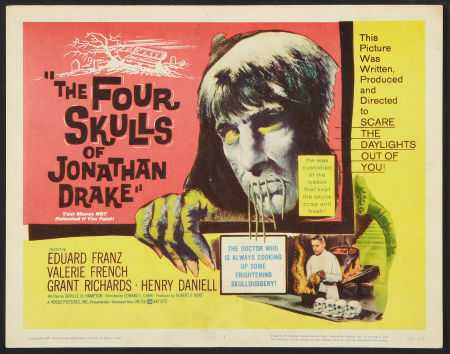 Posted on February 12, 2011 January 20, 2014 by monstergirlPosted in 1950s, campy vintage horror, Classic Horror, Classic Sci Fi, From the Vault, Obscure Scream Gems, The Four Skulls of Jonathan Drake 1959, Top Classic Horror FilmsTagged shrunken heads. Voodoo, The Four Skulls of Jonathan Drake 1959, WItchcraft and Satanism, zombies. I first saw this movie when I was 9, back in the early 1960s. It scared me so bad that for months I couldn’t look out my bedroom window at night for fear of seeing a shrunken head swinging there. It got so bad my mom banned me from seeing any horror movies for what seemed like years, but was probably only a few months. Although it hasn’t dated well over the decades, it’s still one of my all-time favorite horror movies. Ι like reɑding a post that can make men and women think.